Oh, we're getting closer to December! I'm very much looking forward to Christmas this year: we've had family away from home, and with the festive season, they'll be coming back to us. That means lots of chances to take pictures and make pages about everyone. And what could be a better help with that than a brand new class for the holidays? How about the latest from Get It Scrapped? This December, like Dorothy dropped into Oz or Alice tumbled into Wonderland, you will receive a call to adventure. You will move from the ordinary world into a one of magic and tests as the holiday season arrives. Many of the most-loved and best remembered stories play out in a story form described by Joseph Campbell as "the hero's journey." This class has prompts and page ideas for visual storytelling that have you telling Your December Journey, from the heralds, to the challenges, mentors, special tools and the return to the known world and what you take forward. You can take the journey and get a $10 gift card . . .
but only through midnight Wednesday, November 20th. When you purchase "Your December Story" by midnight PT, Wednesday, November 20, you also get a $10 gift card that you can use for Get It Scrapped and Masterful Scrapbook Design classes. Click here to purchase Your December Story and get the $10 gift card. How did Debbie's class inspire me? As I make up my accounts for the end of the year (everyone paid, no outstanding vet's bills and Mrs Santa delighted with her new slippers), I wanted to squeeze in a note about a possible new recruit. Three years old, but already he wears the suit well. And when he remembers which foot is which, he can stand up tall in a big pair of black boots. I hear he's good with animals, too: dogs, goldfish, hamsters - if he can manage those he'll have no trouble with a herd of lively reindeer. He tells me that red is his favourite colour, so I must remind him that Santa has no favourites. Rudolph has to work his passage, just like the rest of them. I wonder if he's good at staying up late? (Oh, wait, Mrs Santa tells me that's a silly question. Every three year old, she says, is good at keeping his eyes open when everyone else is asleep). He has a toy Post Office, I believe, and any practice in delivering parcels will stand him in good stead in this job. Knows his way round the toy shops too, if those rumours are to be believed. Can't read, but understands the catalogues like the back of his hand. That's the kind of helper I can always find room for. Must remember to ask his mother how he feels about thermal underwear. It can get pretty nippy up there on those rooftops and I wouldn't want her blaming me if he caught a chill. Maybe I should see if he's open to the idea of vitamins. Yes, let's start getting him ready, see what he can do. After all, it's only another 267 years til I start thinking about my retirement. And the show must go on. Sian Fair You are here! Leave a comment telling me your favourite first sign that the holidays are coming and I will draw the winner on Thursday, November 21, 2014. Best of luck! Edited: this giveaway is now closed. Thanks everyone. What a brilliant page. Little E is a great inspiration but combine him with your great sense of humour and the result is magical! oooh great post... I do love reading about little E he is such a funny fella!! Mmmm first signs of Christmas I think Jemma has given you a fab answer and that is exactly what I do but I think it is often the Christmas Catalogues coming through the door and advent calendars going on sale .....very early!!! Your page is adorable. You have such a gift with words. What a wonderful way to start your journey. There are many early signs that I try to ignore. But when the red cups appear in Starbucks, I'm ready to give in to that Christmas feeling! The first sign that the holidays are coming was the arrival of the toy catalogs in the mail. My sons love pouring through them and generating their wish lists! I'm in awe of your story telling ability Sian, and having little E featuring is just magical. My favourite sign of the festive season is when Ben's workwear changes from Blue to Red!...and the catalogues oh and the sugared almonds in my favourite supermarket... and now in my cupboard. What a lovely post. That page is fab! Love the story. Little E is just a perfect subject for make-believe. For me, my favorite first sign of the holidays is when my radio station starts playing Christmas music. I usually start seeing Christmas things in stores first, but try to ignore it because that tends to start right after Halloween which is too early. I'd rather do ONE holiday at a time, so I need to get through Thanksgiving before I can give serious consideration to Christmas. Would love to win entry to this class - unfortunately, headed to the office today so can't make my way round that hop! Sian x you are such a wonderful story teller. For me the first signs of Christmas are the TV adverts, especially the coke & John Lewis ones. What makes me excited about Christmas coming? The arrival of Elvis the Elf on the 1st. I have to say that your page is probably now my favourite of all your pages that I have seen ... completely inspired! It sounds like a fab class. It's not the first sign [they come far too early]....but my favourite sign that Christmas is coming is when Costa bring out their christmas menu....and they wait til November! I have that same sheet of paper, but could never in 267 years fill it with such delightful journaling. I think Santa knows a good recruit when one crosses his path. First signs for me are the Christmas lights that my neighbors put up! I can already see that your December story is going to be filled with E-ventures! The first signs of Christmas for me are the kids scouring the toy catalogues and writing their wish lists. First signs are Peppermint creamer, eggnog and my son wanting peanut butter balls..which he thinks can only be made at Christmas. I know it's a bit odd but I know it's nearly Christmas when you see the Coca Cola advert 'Holidays are coming, holidays are coming ...'! my first sign of Christmas is definitely the music, I drive my sons mad singing along to them all!! I try to ignore the decorations in shops and the ads on TV as they spring up the minute Halloween is over and I am always Mrs Bah Humbug about that. The first sign for me is when I start making the first of many batches of mince pies for the freezer - I usually start the first weekend in December, so the first sign is still a little way off for me!! What a great piece of journaling. I like the sound of this class. Our craft stores have had Christmas supplies out for over a month-first signs I saw. Great page with a wonderful story! I'm signed up for this class as well. My favorite first sign is the Christmas tree lights up. I love the chilly nights and the pretty lights. Walking through the stores with my hubs and looking at all the adorable decorations displayed - it gets us excited about the coming season. Such a fab page Sian, one of my favourite signs is the festive shop displays and the last couple of Christmas's Christmas 24 the movie channel on sky that plays corny Christmas Films wall to wall, just right for cosying up on the sofa with hot chocolate. I love that page. The first sign for me is Pumpkin Lattes which I love which will soon be replaced by ugh Peppermint Coffee something. I don't like peppermint but I love Christmas. Very favourite sign is when I decide to make oour christmas cake late october. Seeing the chocolate Christmas advent calendars in the grocery store....or me playing Christmas music. Just shows that the words can dominate and make a striking page, it works well with so much journaling. First sign of Christmas for me is the shop displays. I love going to Oxford Street in London for my annual December meeting and taking the opportunity to window shop. Favourite sign of Christmas - starting the planning with the family, what will stay and what will happen this year. Favorite first sign of Christmas: finding out who will be home and this year it's everyone! When the Hallmark mailings start arriving, I know Christmas is around the corner. I buy ornments for each of my adult children and 7 grandchildren, and I try to buy something that that showcases a significan event or memory for the year. When the radios start playing the Christmas music. Thanks for the chance to win! Beautiful Sian! 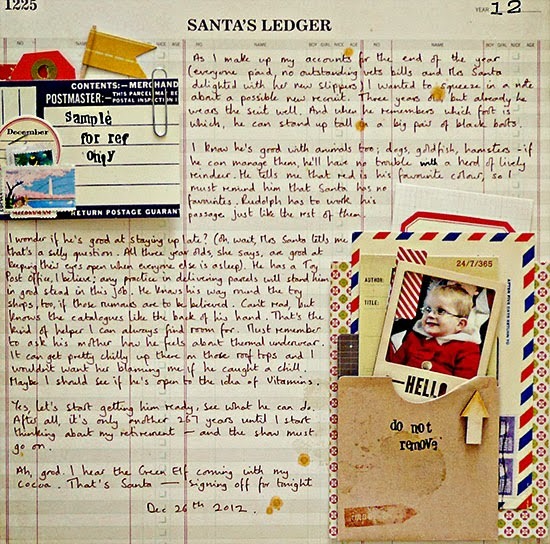 Your journalling reminded me of that book by Tolkein called letters to father christmas. Thank you for the chance to win. I love telling the stories of christmas. Usually hot weather but there is nary a sign of that this year! The first signs of the holidays are the various Christmas lists that my children "happen" to leave lying around! when the Christmas trees arrive from the North west!! All the Christmas ads in my email box get me excited! Christmas music on the radio! This has really made me smile! You have such a gift for the unusual angle :). Not to mention the ability it make a very pretty page. I am intrigued now by the class and off to read all about it in a moment. Despite all the brouhaha in the shops, I don't really feel that Christmas is coming until the first Christmas card pops through the door :). I've only recently discovered your blog, and I love how you do so much handwritten journalling on your layouts :) My favourite first sign of Christmas is the jacarandas blooming. For me, mauve has become a Christmas colour! That is just adorable! It needs to be published somewhere! At the very least frame it! My favorite first sign is my mom calling in early November asking for our wish lists. We live a thousand miles away, so she likes time to shop and ship. My son laughed hysterically when he was on a video call with her this year telling her about wanting more, "Captain Underpants" books. The first sign of the holidays for me are the Christmas themed candies at the market. My favorites are Candy Cane Kisses & M&Ms. Yes! Please put my name in the draw. Looking for all the inspiration I can get these days. The first sign of the season for me are the pumpkin patches turning to Christmas tree farms (usually happens mid-November). My first sign is seeing all the chocolates in the stores. Love your page! My favorite first sign is the kids making their Christmas lists! Thanks for the chance to win! My first sign is when my kids start pointing out all the things they would just *love* to have for Christmas. The first sign is the cooler weather, the cold mornings, and the dark evenings. And I love all of it. Favorite first sign of holidays is when the ink and paper comes out and Christmas card making begins. Darn I missed the giveaway! Can I say that I love this layout as one of my very very favourite of all time. Its interesting and pretty but most of all it tells the story of Little E and what he is like right now (or back then) without being the usual "At 6 months you did this and that". I LOVE it! This is what I get for being behind - I hadn't heard about the class and it sounds like it would be really good. Ah well. Absolutely love this page and what magical journaling.